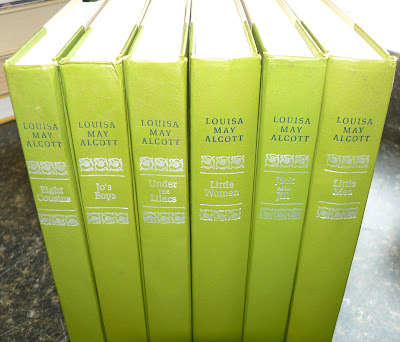 Up for grabs today are six matched volumes from the works of Louisa May Alcott. These six were published by Nelson Doubleday in the mid-1960s and feature black and white illustrations. See the titles in the second photo. You know what to do, comment in this post to enter. I will announce the winner on Monday around noon. Wow! This is some giveaway. Lovely! Please count me in. You rock! Should I feel guilty for lusting after more books? I will promote your generosity so you can share the wealth. My fingers are cross for hardbound books to make a big comeback. Thank you for this wonderful blog. Alcott collection very pretty in green. I'm in. Sorry. Make that "crossed" ... my fingers are only angry about the death of print. What a nice set of books. I'd clear a space in my bookcase for these, for sure! If I did this right now would I increase the likelihood (nice word!) of winning? I'm a newbie to your site and I love it. Thanks! Those are gorgeous. I'm in. I still have my first copy of Little Women, and I am an old woman now. I would love to win such a lovely collection of her works. I love Louisa May Alcott!!! She is the first author I pursued all her works to read, and I was TEN! I still consider her my favorite! The first time I read Little Women was the week I missed school because of chicken pox. That was such an itchy good week! Louisa May Alcott's books were also my escape the summer after fifth grade, and I still love them. A very lovely set of lovely stories. I'd love to win. ooh ooh ooh! I'd love reread LMA. Haven't read her in eons and it's a lovely set. Lovely ascetics. I'd love to win. Beautiful set of books - please count me in. I've been reading for a few weeks and love this blog! Oh, these would be so lovely to have! OK, add me to the list. I've never read Alcott (which is almost unbelievable!) but I am willing to start! awesome! would love to win some nice books. I only recently found your site, and I've been pushing it on all my fellow used-bookstore workers, owners and alums. Love it!! So pretty! And I love the blog! Oh! What a lovely set. Crossing my fingers! This is fantastic. Please enter me. woo woo, count me in! Yes yes yes to an Alcott set! This would make a wonderful gift for my s/o's daughter. Those would be so cool to have. I'd love them. Those do look like a nice set! Oh, I hope I win! My favorite find was a book report my uncle wrote 30 years earlier on "Ben Hur"... I thought it was a great treasure. The rest of the family thought I was silly!!!! woohoooooo count me in for the win... LOL... Granddaughter would simply go nuts! She is a reading fiend! haha Good luck everyone. New here, (introduced through etsy) and don't know if I can win from Canada but if so count me in. Named after Amy in Little Women; she was my Mom's favorite. I would love to be entered in this giveaway! What a lovely set! New to the blog. Love it! Oh, I would love these. What a wonderful gesture. Wish I lived near your store. Thanks! I love Louisa May Alcott. This is a good looking set. Count me in! Oh, mgoodness. I could be a hero at my house if I win this. 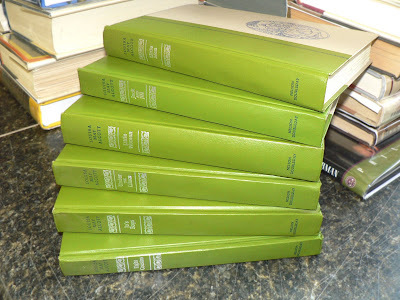 Excellent set - good condition too. Oooo! Count me in! Pick me! Oh, what a beautiful set - the color is to die for! I would love to win it! Thank you for the giveaway! I would love to get these books. I had this set given to me by "Santa Claus" when I was a little girl!! I loved them over the years!! I have a friend that these would be PERFECT for. She loves the books and would cherish these! Count me in, please! Sadly - I haven't read them all - this would be a great chance! This is great! Please enter me in the contest. I love this! They are totally great! Yes please! What a lovely set! We don't really buy sets at the shop where I work, so I rarely get to see things like this (to lust after). Thank you for keeping this blog! I have a copy of my Grandma' Little Women that she got for Christmas as a young girl in 1949! It is one of my most treasured books. Oh I fear I will be too late to enter! But if not... here's hoping! Phooey. I bet I'm too late... congratulations to the lucky winner! I have this same set!! The edges of the pages are raw - the books feel like they have real history. One day they will belong to one of my daughters..